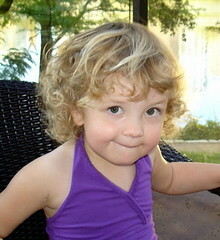 Happy birthday to my ‘baby’ Julia who turns three today. Didn’t I just have her, via extraction out of my middle region? The resulting ‘awning’ says I did. No scar, just a, say, bit of an overhang that fortunately can be concealed even in a two piece bathing suit. Julia is a very 'funny girl' (I'm repeatedly told by her preschool teacher when asked how she's doing in class and with her peers. I'm not sure how to take it but the stories I hear and from seeing her around her brother and others, I understand the 'funny' title). I’m also finding her really fun to hang out, just the two of us. Especially now, that she appears to be departing the 'terrible twos'. She's kinda becomming my new BFF. She wants to do and try everything. She is fearless. Which makes me fearful though admittedly less so than I thought I'd be as she always seems to come out of potentially dangerous situations, completely unscathed. I took down the stair gate by age 2, I don't meticulously survey classrooms and gym childcare areas for safety risks anymore. I handed her a knife long ago as she demanded to cut her own food. I let her play with older kids as I know she can take them down if she has to. She apparently began her physically competitive ways at just a few wee months as noted in Baby Got a Time Out. She already loves clothes, shoes and handbags (good girl) and is more than willing to accompany me to the nail salon, out to lunch or to the mall. I just have to get over the fact that she’s not completely buying into my ‘you must wear solid brown, white and/or black’ thing. She seems to have her own mind and successfully manipulates me into buying her ‘princess stuff’. Why do girls all have to be princesses? I told her when I was still pregnant with her, she was ‘not going to like pink’. Sadly, she was born begging for pink everything to my extreme disapproval. Besides her ridiculously calculated and mature sense of humor, I’m more than impressed with her record-breaking hair growth. She was a cue ball for the longest time and then suddenly – she’s a blonde Diana Ross. I can’t tell you how many times I’ve already had to cut her hair. It’s so tightly curled that when its wet combed straight, it’s almost all the way down her back. Then, it springs right back to above her shoulders. I think it’s magic. Really. I hope she doesn't start trying to iron it flat! She's already said she wants a 'high, back ponytail' which is sadly, for her, nothing more than a ball of fluff sticking straight out from the back of her head. I had to insist it wasn't feasible by showing her magazines and asking 'Where do you see that style Julia? Huh?, show me where anyone is wearing their hair like that'. If interested, here's the link to Flickr to see pictures in chronological order. Anyway, Julia is such a joy and I feel lucky to have her! Happy Birthday, Julia! Way to go, pink or no pink!!! How lucky we October birthday girls are. Jill was 46 yesterday (still my precious first-born) and off to Asia early this morning for a work trip, to be followed by a few extra days in Viet Nam, together with her boyfriend. She'll be gone almost two weeks. The time flies by too quickly - enjoy (and I know you are) your little one all you can because, in a flash, she'll be 46! Well, it's certainly no mystery where she got all that curly hair, or her wicked sense of humor. Give her Birthday hugs and kisses from me and tell her Auntie Wendi has a funfilled day of shopping planned for her when she comes to visit next month. I'm so glad I gave her a pink dress at her baby shower! All little girls should get to be princess for a little while! Melody - she loved that dress!!! I love how little girls love playing dressup! Happy B-day!! !